Maybe we should flip the expectation from the get-go. The city pays to build and maintain streets so people can drive on them. I'd say most of my trips in my car are on city streets, county roads at most. The type of trip that is easily accommodated by single seat or single transfer trip, which everyone is required to pay a fare when they board. Trips that, by and large, aren't really funded by user fees like the gas tax/MVST/etc. Why is the expectation that state or regional funds be the primary funding source for local transit service, and that any local funding is seen as cannibalizing it? Streets are paid through property taxes and assessments. Supplemented by MSAS and CSAH from Highway User Tax Distribution funds. The bulk of the route mileage (and, even a higher share of boardings/alightings) for a bus route like the 5 or 18 or 19 are all in Minneapolis. To the extent that the county wants coordination and to supplement operations, they can pitch in from CTIB, and to the extent that there are transit lines that have broader regional/state significance (akin to state highways inside city limits), the state should pay a larger share as well, reducing the city's burden. This is all theory, obviously. But we treat transit and roads **very** differently, and maybe we shouldn't. Maybe the city, who has strong control over sidewalk design and land use, should be the one who works closer with MT to improve operations so that socially-acceptable transit fares cover a higher % of operating costs, reducing the city's burden via property taxes (heck, or a higher burden! The city could decide it's better to speed buses up by not requiring payment from any stop within the city). You'd still have a regional body operating it so everything integrates from a user perspective, and you save on management overhead. In the general sense, I'd rather have more autonomy to improve service within the city (or partnered with St Paul or adjacent suburbs) and rely less on regional politics (or state funding/rules). Obviously the tradeoff is that 40% of vehicle sales taxes from everyone across the state represents a big chunk of money. But there's a lot of resentment from outstate that comes with that decision. See, all that sounds like a good idea until you start putting numbers behind it. Everything is based on the assumption that Minneapolis and St. Paul would come out ahead financially if funding were flipped to local control and funding over regional/state funding. Not the case. First, Metro Transit's annual operating budget is $390 million. For comparison, MNDOT only plans to spend $930 million this year, so right away that should tell you how relatively large that number is. Second, farebox recovery is just 24.8%, or just under $100 million. That leaves a $290 million gap that must be filled every year, and that number is growing year over year. Now that we have those baseline numbers, let's make some assumptions. 44% of MT's routes are urban local, IE the ones the city would pick up funding for. Let's be really generous here and assume the city, with full control, value engineers those routes for maximum financial sustainability and we end up with a 50% farebox recovery on a $150m budget (that's less than 40% of the current total). So a subsidy of at least $75 million per year. Go ahead and split that 60/40 between the core cities and even then you're looking at the city picking up a $45 million bill per year. For reference, the city's public works budget for street repair in 2015 was only $31 million. You can decide for yourself whether that would fly with taxpayers. I doubt it. But you're assuming current tax structures. If we start requiring cities to find their own local transit then LGA goes out the window and the city can fund it from its sales taxes. A transfer of responsibility like this would be a seismic shift. Apartments being built at Penn-Broadway will have a bus station attached to the building, years before the line even opens. I like this attention to detail. 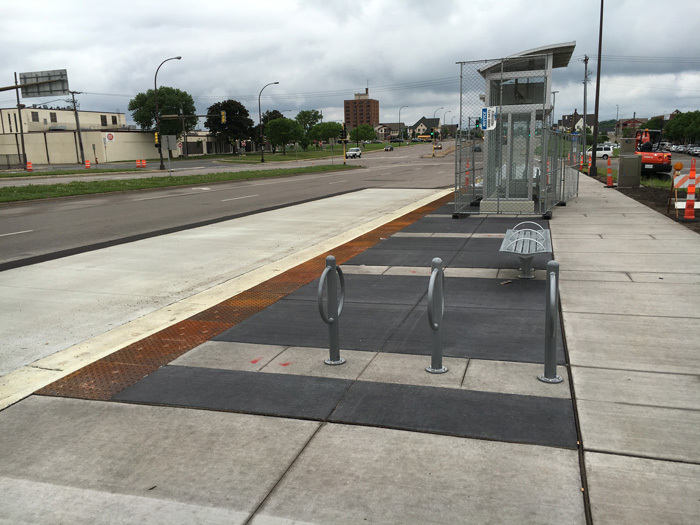 Metro Transit is well underway with constructing two aBRT-ready stations at 7th St N and Olson Memorial Highway. The shelter on the northwest side of the intersection is very far along. 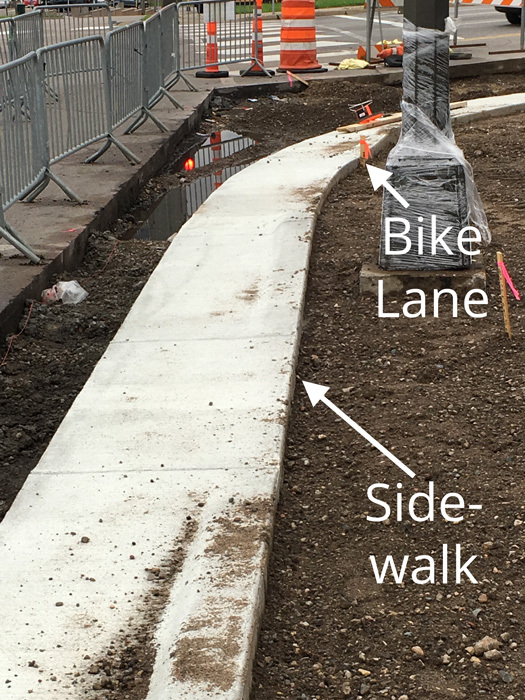 The shelter on the southwest side is just having its curbs and sidewalks constructed now. As far as I know, this will be the first floating bus stop in the region. More information is in the C-Line Station Plan. Kinda a bummer to see so much curb reconstruction when what this area really needs is a complete overhaul in the next 5-10 years. I came here to post the exact same thing. If ever there was an overpaved cluster that needs to be bulldozed and rebuilt from scratch, it's this intersection. ...But, here's some more pictures of the progress on the floating bus stop. Met Council to award nearly $3.8MM design & engineering contract to HDR. Though design and engineering is set to move forward, construction on the $30 million to $35 million project was pushed back a year earlier this year because of a $15 million funding gap. 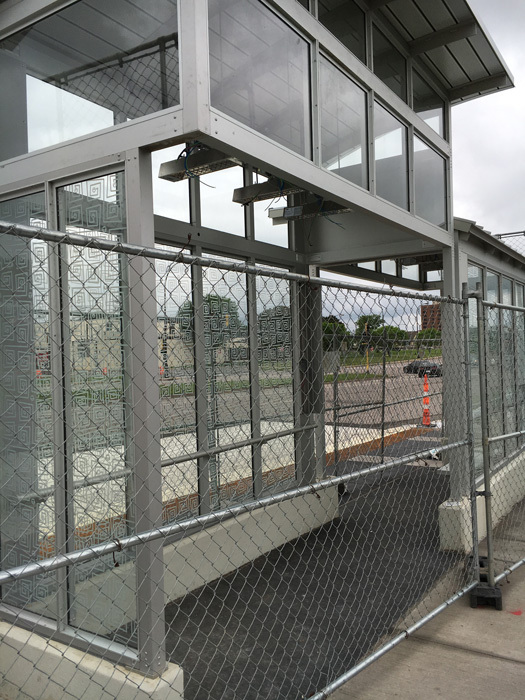 Metro Transit is looking to the state Legislature to fill the gap, Katie Roth, project manager with Metro Transit, said Monday. So far, the project has locked in money from the federal government ($13 million) and the Met Council ($3 million). 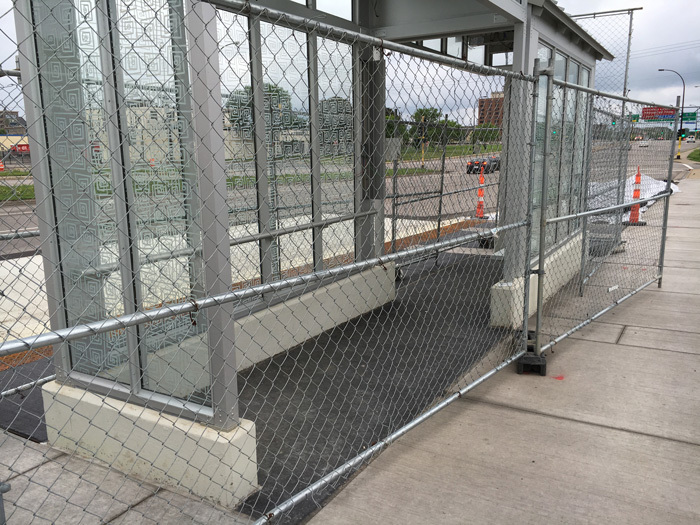 Metro Transit is aiming to start construction in 2018 and begin operating the line in 2019. 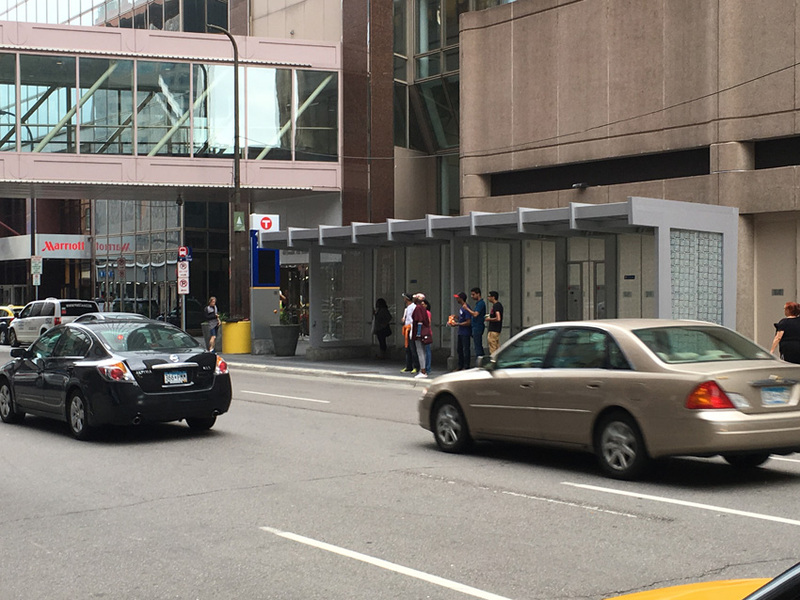 A NexTrip pylon was installed at 7th St & Nicollet Mall in Downtown. 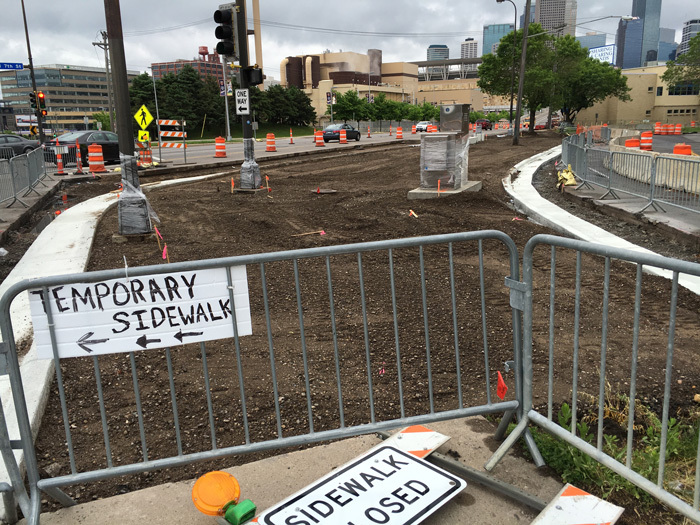 I assume they'll install them at the other pilot stations as well (7th St & Hennepin and two at Olson & 7th St N). Last night when writing the A-line, I talked to one of the drivers, and he mentioned that the C-line would have articulated buses with three doorways. Is that true? Qhaberl wrote: Last night when writing the A-line, I talked to one of the drivers, and he mentioned that the C-line would have articulated buses with three doorways. Is that true? Whoa, so to recap. Bendy blue buses for C line, bendy yellow buses for Orange line, regular blue buses for A line, and regular yellow buses for Red line. Plus the Red and Orange business will be labeled called T METRO. and A & C Lines will have the Metro Transit logo. Anybody else find it a touch confusing? I still think "METRO C Line" has a great ring to it. Its too bad the C-line is delayed a year. Is that because of funding? Will the CTIB mess cause any additional delays? I too like "METRO C Line" for a name. SkyScraperKid wrote: Whoa, so to recap. Bendy blue buses for C line, bendy yellow buses for Orange line, regular blue buses for A line, and regular yellow buses for Red line. Plus the Red and Orange business will be labeled called T METRO. and A & C Lines will have the Metro Transit logo. Anybody else find it a touch confusing? I find it less confusing than the litany of branches most local routes have. Yeah, yellow buses on freeways and blue buses on normal roads doesn't seem that bad. As far as articulated vs not, we mix those even within the same route, and no one gets confused. Preliminary recommendation says to realign the C Line to Glenwood Ave once the Blue Line Extension is complete. Community outreach about the study starts next month. Personally I think this is a good idea, but doesn't this get back to our other discussion about frequency vs network coverage?